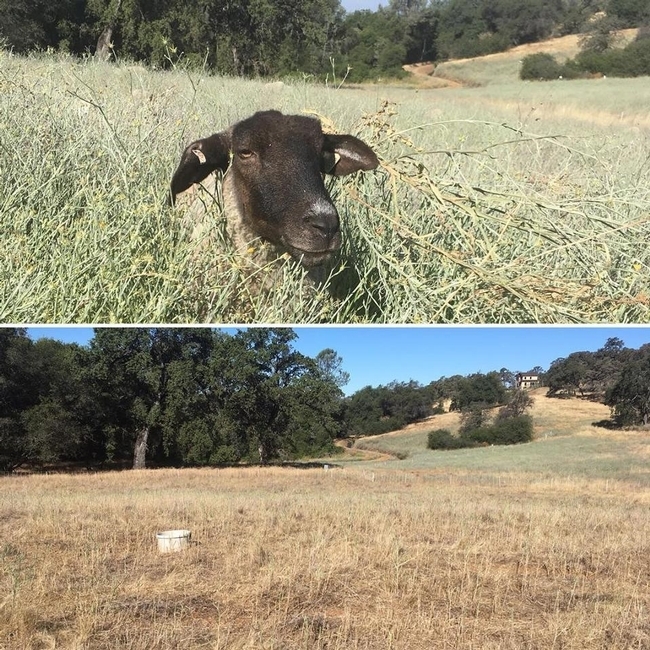 Targeted grazing using sheep, goats, or cattle (or combinations of two or more species) can be an effective way to manage vegetation for a variety of goals. Given the ever-present threat of wildfire in the summer and fall months in the Sierra foothills, many landowners and land managers are considering hiring targeted grazing contractors to help manage wildfire fuel loads. Targeted grazing can be a cost-effective alternative for reducing fine and ladder fuels over large and rugged landscapes that may be inaccessible for equipment or hand crews. Targeted grazing is especially effective at maintaining fuel reduction treatments like shaded fuel breaks. Unlike many treatment methods, targeted grazing actually removes fuel from the landscape - the wildfire fuels are removed by the grazing/browsing livestock. Targeted grazing contractors can often provide all necessary infrastructure (fencing, livestock water, predator protection, etc.). By managing the type and number of animals, the duration of grazing, the season and frequency of grazing, and the spatial distribution of livestock, targeted grazing can help landowners and managers achieve a variety of land management goals. Where is Targeted Grazing Effective? Well-managed targeted grazing can be used to address site-specific landscape goals. For example, targeted grazing can impact specific invasive weeds (like yellow starthistle, medusahead or Himalayan blackberries). By controlling competing vegetation at crtical times, targeted grazing can enhance habitat restoration efforts. Finally, targeted grazing can reduce fine fuels and ladder fuels to reduce wildfire danger in a variety of environments. Typically, targeted grazing is a cost-effective vegetation management alternative where other options are ineffective. Specifically, targeted grazing can be more cost effective on landscapes that are too steep, rocky or remote for conventional vegetation management (like mowing or chemical treatment), or in the urban-wildland interface where burning is not an option. Grazing livestock have three basic impacts on the landscape. They consume vegetation through grazing, they trample vegetation (which can facilitate the breakdown of plant carbon in the soil and modify wildfire fuel profiles), and they transfer nutrients through defecation and urination. Targeted grazing uses all three impacts to accomplish specific vegetation management goals. Targeted grazing contractors also have a solid understanding of the growth characteristics and vulnerabilities of specific target vegetation. For example, grazing yellow starthistle with sheep or goats during the bolt stage (April to June, usually), can dramatically reduce seed production. Browsing Himalayan blackberries in the fall as the plants are going dormant can stress root systems at a key period. Timing of targeted grazing for fuel reduction is also important. To reduce the potential for re-growth, fuel reduction grazing should be done after the last spring rain. Since the nutritional quality of annual grasslands typically declines rapidly at this time of year, targeted grazers may need to provide supplemental nutrition to ensure appropriate impact to targeted vegetation. In some instances, cattle may be the most appropriate species for particular projects. Why Pay Someone to Graze? Isn't Free Grass Enough?! Targeted grazing is a very different business model than simply grazing for livestock production. Effective targeted grazing focuses on impacting target vegetation at exactly the right time for specific landscape or vegetation goals. Traditional livestock production, on the other hand, focuses on putting weight on animals or increasing reproductive success. Traditional livestock operations generate income from the sale of animals and animal products; these operations focus on body condition and the nutritional status of the animals at specific production stages. Targeted grazers generate income from vegetation management services; these operations may accept a drop in body condition or reproductive success to achieve desired impacts to low quality forage as long as this service is paid for. Unlike equipment, which can be parked when not in use, livestock must be fed before they arrive on your property and after they leave. Part of the service that targeted grazing companies provide is the logistical planning necessary to keep their livestock "employed" throughout the grazing season. Realistic landowner and land manager goals are important for successful targeted grazing applications. Targeted grazing is often a long-term approach that addresses prior problems. For example, invasive weeds may be symptomatic of a long-term lack of management. A single targeted grazing project is unlikely to address these long-term symptoms; a multi-year approach will likely be necessary to improve ecological function and reduce the weed seedbank. Recognizing this, many targeted grazing contractors will reduce their annual per acre charges in exchange for multi-year contracts. Expectations are also important. Landowners who expect a uniform appearance to land treated with grazing (as if the land had been mowed) will likely be disappointed; grazing often leaves a patchy appearance on the landscape. Furthermore, grazing does not often provide the immediate visual effects of chemical treatment, mastication, or mowing. Vegetation treated with herbicide, for example, often shows immediate impact; grazing is a long-term management technique. Finally, timing is critical. If targeted grazing occurs too early in the season, soil moisture may be sufficient for the targeted vegetation to re-grow. On the other hand, the palatability of annual grasses and weed species may decline as these plants mature. Contractors often provide supplemental nutrition and other management techniques to impact this lower quality forage at the optimal time. Targeted grazing companies are service providers. Consequently, experience, responsiveness, and attention to detail are critical. Consumers should look for companies with experience in grazing projects in similar environments and situations. Ask potential contractors about their experience level – and ask for references. Targeted grazing may not be the least costly vegetation management option (compared to mowing or herbicide treatment). As outlined above, targeted grazing is often the best alternative where other treatments aren't possible. Relative ease (or difficulty) of setting up infrastructure, including loading and unloading facilities. Projects in steep or difficult-to-access terrain require more labor (and, therefore, are typically more costly). Access to livestock water. Easily accessible water can make the project less costly; projects without access to water may require the contractor to haul water to the livestock. Other risks, like vandalism, toxic plants, or proximity to high-value landscaping may increase the cost. Multi-year contracts are typically cheaper on a per acre basis. Livestock and targeted grazing staff become more accustomed to a particular property (and therefore more efficient) if the contract is for multiple years. Headache factors – like free-roaming pet dogs or neighbors who object to livestock or livestock guardian dogs – can increase the cost of a project. Landowners and managers should contact targeted grazing contractors well in advance of the desired project start date. Targeted grazing contractors are busiest during the spring and early summer months; scheduling these jobs typically occurs in during the prior fall and winter. Targeted grazing can be a highly effective way to reduce fuel loads, control invasive weeds, and manage ecologically sensitive landscapes. Livestock be an economical and eco-friendly way to manage vegetation on landscapes where equipment is impractical. For a list of local and regional targeted grazing contractors, click here! If you are a targeted grazing contractor who does work in Placer, Nevada, Sutter or Yuba Counties, please email your information to me at dmacon@ucanr.edu. Fire Season is Here: Is Your Ranch Ready? Earlier this week (the first full week of June 2018), we had several small wildfires near Auburn. Our informal rancher telegraph system was activated - many of us started texting or calling one another to find out where the fires were burning and whether anyone needed help. With record-setting forage production in our part of the Sierra foothills, many of us are preparing for another challenging fire season. Wildfire preparations are more complicated for commercial livestock operations. Like our neighbors, we need to create a fire safe space around our homes; we also need to think about protecting ranch infrastructure and livestock. If you haven't prepared a ranch fire safety plan, or even if you have one in place, the beginning of fire season is a reminder that we all need to be prepared! Here are a few ideas for putting together a plan for your operation. We need to protect our home, barns and other infrastructure at our home place. We have livestock in several locations. Where we have irrigated pasture, we aren't quite as worried about fire. Where we're grazing on dry grass, we are more concerned. While fire is an immediate threat to the health and well-being of our animals, it can also reduce the amount of fall forage we'll have. Access can be a challenge during a fire. Single-lane roads, law enforcement road blocks and other obstacles may make it difficult to get our livestock during a fire. 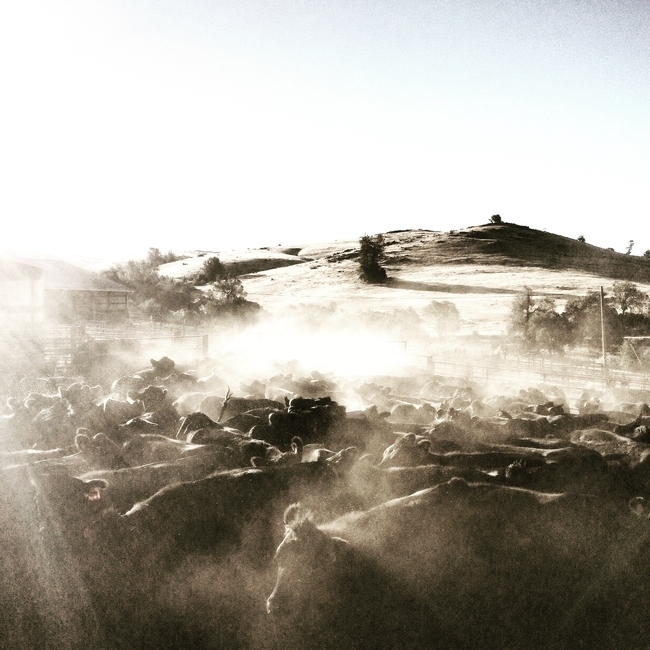 Smoke can create health problems for people and livestock alike. About ten years ago, during a particular smoky stretch of the summer, we had an increase in respiratory disease in our sheep. Because many of us have operations that are spread over multiple locations, getting timely and accurate information about where fires are can be challenging as well. I find that www.yubanet.com usually has the most up-to-date information on fire location and size - be sure to check the "Happening Now" tab. CalFire also has a phone app that purports to send alerts when fires start near your location, although I've found that the app doesn't provide the real-time information I need about small local fires. Many of us have informal phone trees with the other ranchers in our area - this can be the best way to get in-the-moment information! Be sure you know the neighbors where your livestock are grazing! Protecting Buildings, Infrastructure and Information: All of us should make our home places fire safe! Remove flammable vegetation within 100 feet of our homes and other buildings. Don't forget other critical infrastructure like propane tanks, wells, equipment sheds and barns. Also be sure you have protected critical legal documents and insurance information. You should also check CalFire's suggestions for putting together an emergency supply kit (http://www.readyforwildfire.org/Emergency-Supply-Kit/). Protecting Forage: Many of us stock our operations conservatively to ensure that we have fall forage for our livestock. You might consider creating fuel breaks to protect this forage. Disking or grading around the perimeter of pastures, or at least adjacent to potential ignition sources. Another alternative would be to use targeted grazing adjacent to roads or pasture boundaries - this can reduce the fuel load and slow a fire down. The width of any fuel break depends on the fuel type, topography/slope, and potential flame lengths that a fire might generate. Protecting Livestock: We try to think ahead of how we might move animals out of harm's way. Given enough warning, we would either haul livestock away from a fire or herd them to a safe location. Many of us, however, have too many animals to evacuate on short notice. Leaving animals in pasture (or "sheltering in place") might be the best option in many cases. If you need to leave animals in place, be sure they have enough feed and water for several days. Will the animals have water if the power goes out? Be sure to take down temporary fences or other hazards that may injure animals as the fire moves through your property. Water Supply: Water is critical for protecting our properties and for keeping livestock healthy. Do you have adequate water supplies for wetting down your buildings and facilities, or for directly fighting fire? If you have to pump water, do you have a backup system in case you lose power? Can you provide stock water if the power goes out? You may wish to consider investing in a backup generator and/or additional water storage. Escape Routes: Ideally, we should all have at least two routes in and out of our ranch properties. We try to think about at least two alternatives for moving our livestock to safety in the event of a fire - and this means loading and unloading facilities, a plan for gathering livestock, and a clear understanding of the road system near our pastures. Narrow roads can be problematic for navigating with stock trailers, especially when fire equipment is also inbound. Backup: Obviously, we can't all be on hand 24 hours a day, seven days a week to respond to a fast-moving fire. Consider working with friends, neighbors or colleagues to have a backup plan to evacuate or otherwise protect your livestock. Consider meeting with your neighbors to go over key livestock facilities, evacuation plans and access routes. Be sure to check in with these backup resources in the event of fire. Communication Plans: Do you have phone numbers for the other ranchers in your area? Do you know who runs the cows or sheep next door? Most of us probably do! During fire season, many of us text or call our neighbors when we see smoke. Perhaps it's time to formalize these calling trees. Contact me at dmacon@ucanr.edu if you'd like help setting up a calling tree for your area. Situational Awareness: If you're like me, your ear can tell the difference between a fire plane and a regular aircraft. Whenever I'm outside this time of year, I scan the horizon for smoke - especially when I hear fire planes overhead. I carry fire tools and a 5-gallon backpack pump in my truck during fire season, as well, and I'm constantly aware of my surroundings when I'm working in dry grass or brushland. The Detwiler Fire in Mariposa County (which has burned over 45,000 acres as of this post) reminds us that California's annual rangelands are especially vulnerable to wildfire. After record-setting rainfall in the just-concluded precipitation year, we have an unusual amount of fine fuels (dry grass and forbs). And after our just-concluded 500-year drought, we're still coping with significant tree mortality problems, especially on the west slope of the southern and central Sierra Nevada. (As a side note, I drove through the region currently impacted by the Detwiler Fire last fall - the number of dead Ponderosa pines was astounding). For me, at least, the threat of wildfire is a top-of-mind issue every year until the fall rains begin. I'm sure that those of you who also graze livestock on annual rangelands during the dry season feel the same way! For me, there are three areas where I focus my attention when it comes to the threat of wildfire. The first is situational awareness. Obviously, when I'm checking sheep or building fence, I keep an eye on my surroundings - a puff of smoke commands my attention immediately. I'm cognizant of wind and humidity, as well. A fire plane makes a distinctive sound - a low flying fire plane suggests that there's a fire close by. Even when I'm sitting in my office (which is about 8 miles from our annual rangeland pastures), I listen for the sound of firefighting aircraft - the rest of the staff in Auburn is now used to seeing me run outside to look for smoke when we hear planes go over this time of year! The second is preparation. As we enter fire season, we talk about where the sheep will be and where we might be able to move them if a fire threatens. 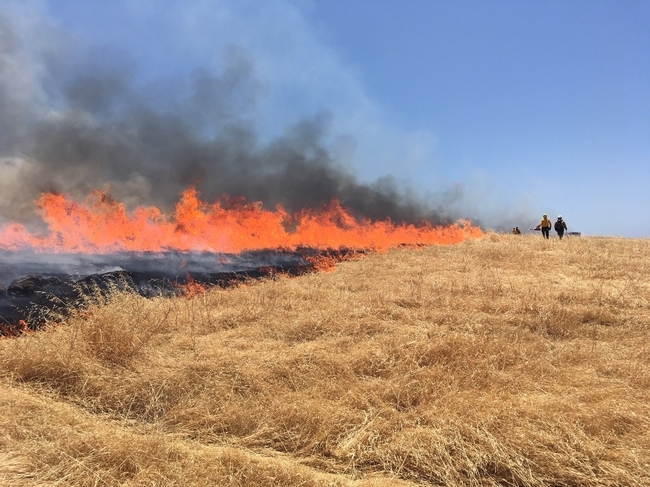 While hauling the sheep out of harms way is our preferred option, we also discuss potential safe areas, including nearby irrigated pastures, green belts or areas cleared of vegetation. I also carry a McLeod fire tool and a 5-gallon backpack pump in my truck - it's important to be prepared. The third area of focus is response. Fortunately, in the 15 years we've raised livestock commercially, we've never had to respond to a fire directly threatening our animals. We have lost fences on leased properties to fire, but we've never been forced to evacuate (for which I'm very grateful). As fast as the Detwiler Fire is moving, I suspect we wouldn't have much time to respond. Our option of last resort would be to let the fences down and hope that the ewes and the guard dogs get somewhere safe.